From local hot spots to popular attractions, there’s always something to do when staying at Discovery Settlers Hotel Whangarei. Only 30 minutes from some of the country’s most spectacular beaches, and a mere 5 minutes from lush native bush walkways, we are perfectly placed for sightseeing around Northland and offer a range of refurbished Whangarei accommodation and FREE unlimited WiFi during your stay. Christchurch's newest luxury accommodation; Distinction Christchurch Hotel is now open. The 4.5 star hotel is centrally located in the revitalised Cathedral Square and offers 179 elegant, air-conditioned hotel rooms including 3 floors of brand new Superior Rooms and Suites. Complementing this brand new Christchurch accommodation is conference facilities catering up to 200 delegates, the stylish Gumption Restaurant and Bar, undercover valet carparking and FREE unlimited WiFi. Distinction Coachman Hotel is nestled in the heart of Palmerston North, a mere 800 metres from the CBD and 10 minute drive from the airport. The Palmerston North hotel offers 73 contemporary-style rooms and suites that all feature SKY TV channels, FREE unlimited WiFi, tea & coffee-making facilities. Some studios offer cooking facilities. Enjoy complimentary car parking, 24 hour reception, restaurant & bar and access to an outdoor swimming pool and spa pool. Stay at Dunedin's premier luxury hotel. The Distinction Hotels Group has transformed the 1937 former Chief Post Office in Dunedin into an elegant 4 1/2 star hotel, located in the rejuvenated and vibrant Warehouse Precinct in the heart of the city. The modern Distinction Dunedin Hotel consists of 121 elegant suites and studio rooms, FREE unlimited WiFi, Parcels Restaurant, Post Bar, unique private dining Vaults and on-site gym. Superb Fox Glacier hotel accommodation, Distinction Fox Glacier Hotel offers luxury in a modern, purpose-built hotel, surrounded by rugged and stunning mountains. Sumptuous breakfasts are served each morning in the hotel's on-site restaurant. Guests can enjoy FREE unlimited WiFi, 50+ SKY channels, complimentary undercover car parking and access to the cosy lounge area with fireplace and library, a great place to relax with a glass of wine and enjoy views of the township and river valley. 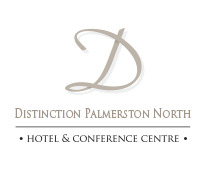 Distinction Hamilton Hotel offers 147 refurbished, air-conditioned rooms and suites and guest services including FREE unlimited WiFi, gym, 3 spa pools and an indoor swimming pool. It also boasts a restaurant, bar and some of the largest conference facilities in the Waikato area. Located only minutes from the Hamilton city centre and conveniently located to reach any out-of-town places of interest, this Hamilton hotel is a favourite with business travellers and holiday makers alike. The perfect holiday base for all your Fiordland travel, Distinction Luxmore Hotel provides comfortable, refurbished accommodation with FREE unlimited WiFi, in one of New Zealand’s most popular scenic areas - Te Anau, gateway to the stunning Milford Sound and Doubtful Sound. Offerring 2 on-site restaurants, FREE unlimited WiFi, complimentary guest car parking and an excellent standard of service, the team at Distinction Luxmore Hotel will make your stay in Te Anau comfortable and enjoyable. The ideal Palmerston North accommodation choice for the smart traveller, the elegant 4-star hotel boasts 85 well appointed, modern guest rooms & FREE unlimited WiFi. Situated in the hub of Palmerston North’s buoyant CBD, a few minutes’ walk from shops, the museum, Palmerston North Conference & Functions Centre, art galleries & theatres. Offering one of the largest conference venues in the lower North Island with four function rooms, an on-site cosmopolitan restaurant and two stylish bars. Superior accommodation at affordable rates, located in a central location make Distinction Rotorua Hotel your choice of stay. Offering 4 in-house restaurants and bars, outdoor heated swimming pool, Jacuzzi, sauna, complimentary and secure mountain bike storage and FREE unlimited WiFi. A visit to Rotorua is not complete without experiencing the hotel's dynamic Maori Dinner & Culture Show. Also offering the largest hotel-based conference venue in Rotorua. Welcome to Distinction Te Anau Hotel and Villas, offering chic, elegant hotel and suite accommodation, FREE unlimited WiFi, complimentary off-street car parking as well as delicious on-site dining in the MacKinnon Restaurant. Our lakefront location is part of New Zealand's largest world heritage area; Fiordland, gateway to Milford Sound and Doubtful Sound. Distinction Wanaka Alpine Resort is nestled in a quiet Lake Wanaka location and guests can enjoy access to the resort facilities whilst staying in the serviced apartments. The stylish, self-contained, serviced 1, 2 and 3 bedroom apartments, each provide a high level of personal comfort and convenience, perfect for all seasons. On the doorstep of key Wellington attractions including Te Papa Museum, Distinction Wellington Hotel's 89 guest rooms range from impeccably designed studios, to luxurious penthouse suites. Each room boasts stylish contemporary design and functionality, superior space, and all the modern conveniences including kitchen and laundry facilities; as well as comforts such as leather lounge suites, LCD TV's, balconies and FREE unlimited WIFI for guests during their stay. Conveniently located opposite the stunning Whangarei Town Basin and a few minutes walk from the city centre, this Whangarei hotel is perfectly suited to both business and leisure travellers. All comfortable guest rooms and suites are air-conditioned and offer free unlimited WiFi. Restaurant, bar, indoor swimming pool, spa, gym and conference facilities are also available. Hmm, the information you’re looking for can’t be found. Click here to go to the home page.